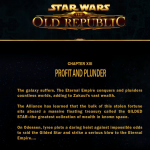 Welcome to Star Wars, the Old Republic’s latest instalment, Profit and Plunder. If you don’t know the story to this point, beware SPOILERS!!!! May follow. 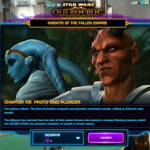 Apparently, the galaxy is still suffering, despite your best efforts, you being “possessed” by Emperor Valkorion, and having created an alliance of Empire and Republic. The first instalment of this new, month by month release schedule, back at the beginning of the year, was quite interesting. The last few chapters have been pretty boring. I suspect that what bioware is trying, and failing to do is to keep people interested, and subscribed, by releasing stuff this way. They promise a free gift, and early access (2 days) if you subscribe. Subs are basically 15USD per month, so it’s not huge. However most of us can’t afford to pay for multiple games, and this is their attempt to deal with that. The upshot is, the gifts are not really fan tastic, and the chapters are becoming kind of boring, especially when a lot of people have to do it multiple times. The promised “what you say and do will have huge effects on the story” does not seem, up to now anyway, to be true. Anyway, on to the chapter. 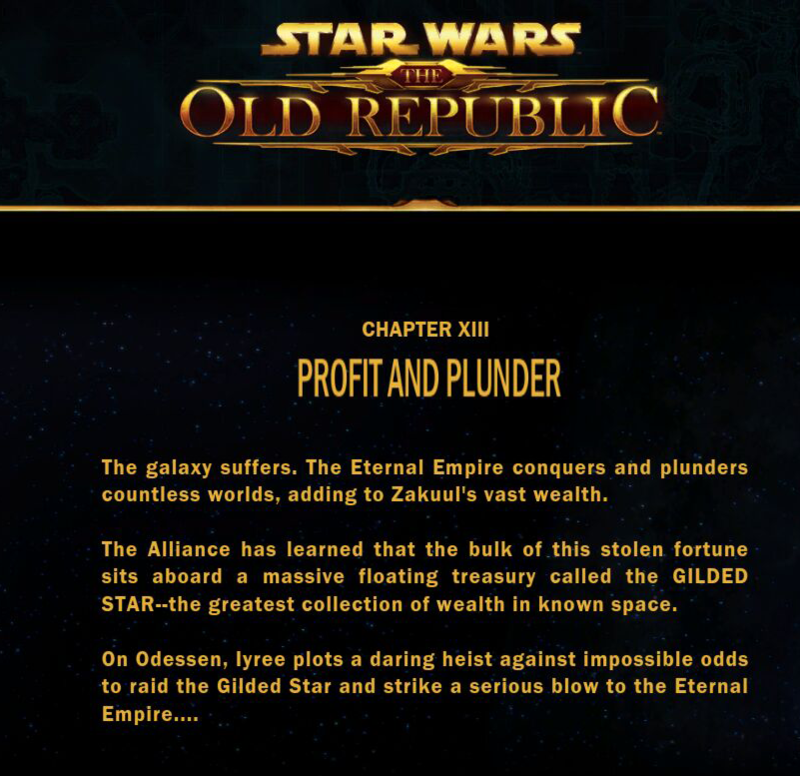 The first time you do this chapter, it seems like it might be pretty cool, striking the heart of the Zakuul Empire, right where it hurts, the wallet. 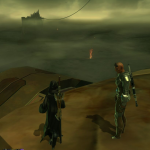 You are reunited (or united, depending on which class you are playing) with 2 companions you may or may not have had previously. 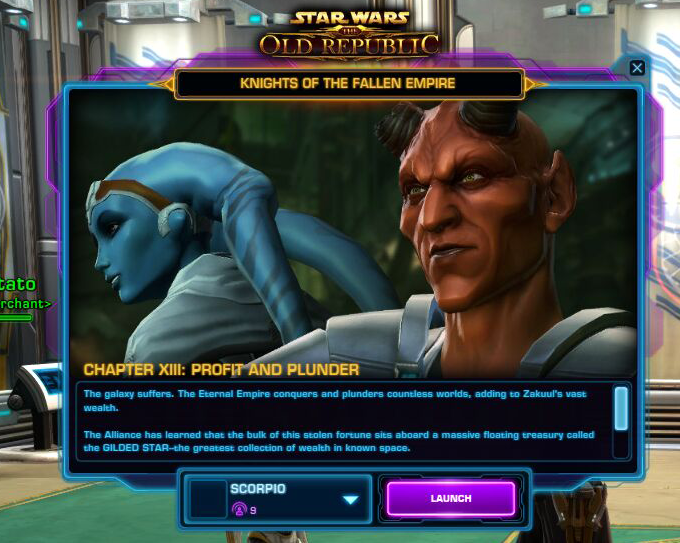 I recently did this using a dark side Bounty Hunter, who previously had Gault(the broken horned chap – who is the dodgy underworld, untrustworthy gambler type – always looking for scam) apparently his Likes: Greed, indulgence, thinking your way through a problem and his Dislikes: Fair fights, pain, charity, rules. He ripped off his girlfriend (Hylo Visz, which I reckon is probably the best character name ever, and who is also in charge of part of your alliance), so you understand the kind of guy he is. 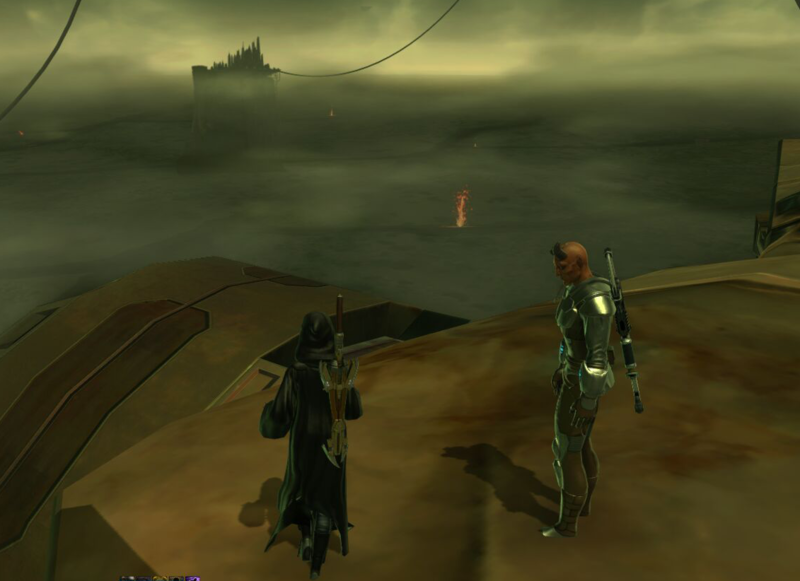 Some of the conversations were pretty fun, or at least as much as they can be. 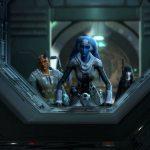 The blue lady is Vette, a tomb robber, who is also pretty feisty and likes to play practical jokes on people, particularly Gault, which is fun the first time, but a bit boring after novelty has worn off. 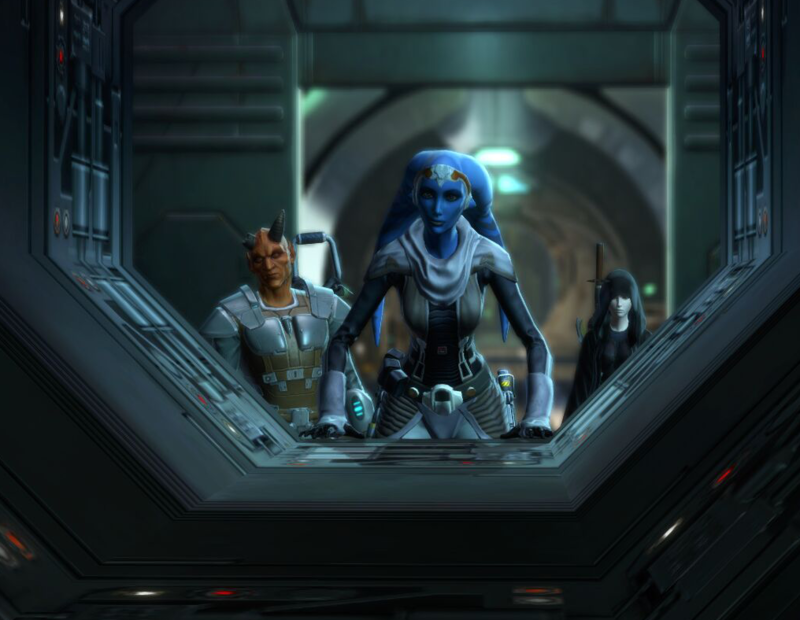 Basically, without spoiling the story, Zakuul, as foolish as they are, store all their gold in one place, which conveniently Gault knows about, and your task is to get in and steal it to fund the resistance. It’s a nice story, but it seemed just a little bit long, a little bit slow, and the ending is kinda predictable.